This entry was posted in Uncategorised on 21st Mar 2019 by Julian. 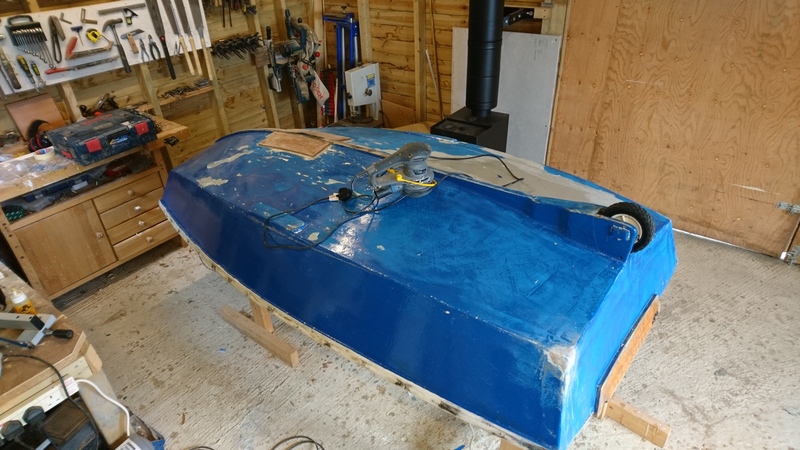 I’ve finished the last bit of anti fouling. All other jobs done, I hope. Just have to put Daisy Grace back together ready for launch on April. This entry was posted in Uncategorised on 28th Feb 2019 by Julian. 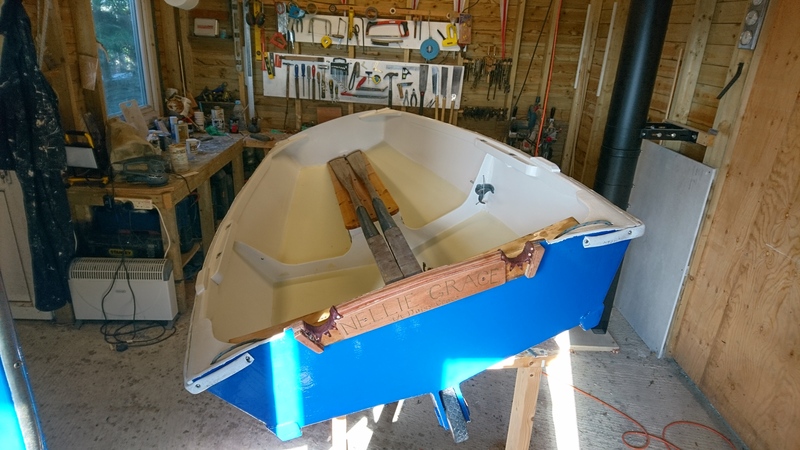 I have stripped down Daisy G’s tender , Nellie Grace, cut down her transom , added sacrificial parts in various worn places and completely repainted her. Now she is stored away in her old roost , up in the roof, for the winter. This entry was posted in Uncategorised on 9th Oct 2018 by Julian. I’ve finally fixed the nasty crack in the port side deck. Second repair I’ve made in this deck, it is just too thin. First, mark the full extent of the cracks and cut out a rectangular area covering all of it, using the magical Bosch multi tool. I use this tool all the time. Cut a plywood backing patch, about an inch larger all round than the hole. Two holes drilled through this fit a support string loop. This patch is epoxied to the underside of the deck, held in place with wedges through the loop. This entry was posted in Uncategorised on 6th Oct 2018 by Julian. I have ticked of two more winter jobs. Repositioned my compass onto the companionway hatch, where it will be more in my line of sight when I’m sailing. This entry was posted in Uncategorised on 3rd Oct 2018 by Julian. This should have been a half hour job. 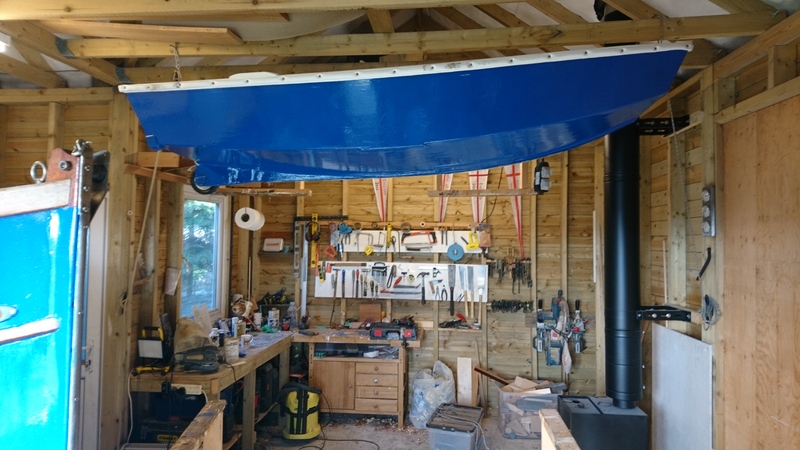 Two simple wooden supports which slot into the ends of the trailer frame, to hold the lighting board when there is no boat on the trailer. Only one of the tightening bolts had rusted solid. When I turned it with a pipe wrench, the threaded insert broke loose from a poor weld and just turned beneath the bolt. In the end I had to saw off the plastic top and the use a powered multi tool to saw through the bolt. Eventually achieved after two hours lying on my back under the boat. Spent half an hour in a sauna after to bake the aches out of my back. This entry was posted in Uncategorised on 2nd Oct 2018 by Julian.